If players like to play slots with basic themes, then Gems Gone Wild is a perfect treat for them. This new ‘gem’ variant is a product of Red Tiger Gaming and is fully packed with lots of twinkling diamonds. The slot background is portrayed against a space like scenario and the sound effect ups the excitement of the game. The slot has medium to high volatility and offers an RTP of 96.05% to its players. 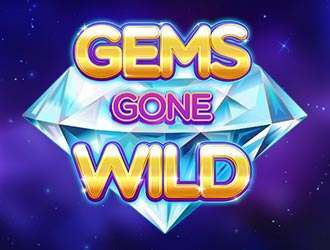 Try To Grab Gems In Gems Gone Wild! Gems Gone Wild is played on 5 reels, 20 paylines grid format. The players are required to land 3 similar symbols on any single payline so as to form a winning combination. The slot can be played from a min bet value of 20p a spin to a max bet value of £500.00 a spin. The reels of Gems Gone Wild consist of a variety of brightly-coloured gemstone symbols. The prizes awarded for landing symbols are 2 coins if players manage to land three of pink gemstones and if they hit 5 orange circular jewel symbols on reels, up to 300 coins can be won. The slot includes a wild symbol which awards 20 to 600 coins if players land 3 to 5 of these on any payline. The players will also notice that this slot does not have any scatter symbol which means there are not any usual free spin or special bonus features to trigger. Despite, there is a unique Wild Re-spins feature instigated during the base game which helps you to reap rich rewards. During any spin, you must look out for rotating circles that will appear randomly around any symbol. After which, the circles will explode so as to turn that symbol into a wild or maybe turn multiple symbols in a row into the wild. The players will now be provided with a respin along with the newly appearing wilds frozen at their place. When new wilds will land on the spin, they will also get locked in the position and another respin will follow. Gems Gone Wild is an exciting slot game. Red Tiger Gaming is always known for doing experiments with different types of storylines and themes and thus they have introduced a stylish slot which is recommendable for all the players. It also includes an auto spin feature.